Marina Bloom ... an artist’s impression. Al Shafar General Contracting (ASGC), a leading and award-winning UAE construction group, has completed structural work for the Marina Bloom, a luxury mixed-use development at Abu Dhabi Marina. Initial construction work started in April 2014 and the project is expected to be fully complete by Q3 2016. With breath-taking views of the Arabian Gulf and the city, the development features a five-star hotel, 57 executive serviced apartments, as well as waterfront retail areas, providing residents and guests with a luxurious and holistic hospitality experience. 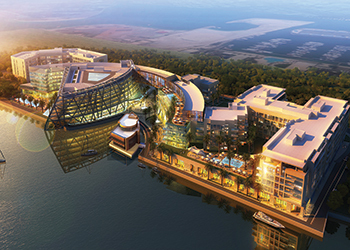 Abu Dhabi Marina is a mixed-use project developed by award-winning developer Bloom Properties in the renowned Al Bateen Area of the UAE capital. Over the past 25 years, ASGC has worked on more than 280 projects and has developed a deep understanding of the local construction market with a reputation for consistently delivering high-quality projects. ASGC’s landmark projects include the Waldorf Astoria Hotel and Golden Mile (Palm Jumeirah, Dubai), City Walk (Jumeirah, Dubai), Jumeirah Beach Residence Sector Six (Dubai Marina, Dubai), Business Central Towers (Sheikh Zayed Road, Dubai), and Marina Bloom (Abu Dhabi Marina) among others. Oman-based Galfar Engineering and Contracting secured contracts worth RO132 million ($342 million) during the first half of this year, boosting its order book to more than RO700 million ($1.82 billion), a report says. However, the company’s net profit dropped to RO200,000 ($518,000) during the period, down from RO2.4 million ($6.24 million) for H1 2014, marking a decrease of 91.6 per cent, adds the Oman Observer report. Revenues earned by the parent company also declined to RO163 million ($423.6 million) for the first half of this year, against earnings of RO185 million ($480.8 million) for the corresponding period of 2014. The decline in revenues was attributed by Galfar vice chairman Salim bin Abdullah Saeed Badr Al Rawas to delays in the issuance of contract commencement orders by clients in a number of projects, the report says. These projects include the Barka-Nakhal and Taqa-Mirbat roads, the Liwa fishery harbour and the Royal Oman Police New General Hospital projects. “The Muscat airport catering building project slowed down in the first half of the year due to non-receipt of advance payment. This issue has been resolved and the project is now in progress,” Al Rawas states. “The company has not taken revenue against eligible claims which are under consideration with clients and consultants, wherein costs have already been incurred. “The company still faces difficulties in the matter of collections from certain clients and is continuing its best efforts to reduce the receivables,” he adds. Leighton Contracting Qatar, a division of UAE-based Habtoor Leighton Group, has signed a QR2.2-billion ($604 million) project finance deal with Qatar’s Doha Bank to support the construction of a water reservoir project in the country. The ‘Water Security Mega Reservoirs Project’ being undertaken by Qatar General Electricity and Water Corporation (Kahramaa) at Rawdat Rashed, will boast the largest concrete reservoirs in the world, with capacities close to 100 million gallons each, according to The Peninsula report. “We are pleased at the opportunity to participate in a project that will form the bedrock upon which Qatar’s water security initiatives will be built,” Dr R Seetharaman, Group CEO of Doha Bank, is quoted as saying in the report. The project aims to provide seven days of water storage within Kahramaa’s network, covering the new mega reservoirs and the existing and future secondary reservoirs. The first phase will provide seven days of water storage for expected water demand in 2026, with five mega reservoir sites, while the second phase will provide the seven days of water storage for expected demand in 2036 by adding more reservoirs within the five sites. The first phase, which is currently under way, will deliver storage capacity of about 2,300 million gallons of water in 24 concrete reservoirs and some 480 km of buried ductile iron pipelines with diameters up to 1.6 m. The second stage, which will be implemented after 2020, will include construction of additional pipelines and 16 new reservoirs within the five sites to achieve an ultimate total storage capacity of about 3,800 million gallons of water.